There is no denying winter is here as UW was blanketed in snow for most of February. In fact, this is the most snow campus has seen since 1949, which also happens to be the year the HUB first opened (originally called the Associated Students Memorial Union). It is 70 years later and the main infrastructure of that original building still stands, and it has grown significantly with two major additions and the 2012 renovation. This is much like our students, who come to UW and get involved with ASUW, GPSS, and other student organizations. 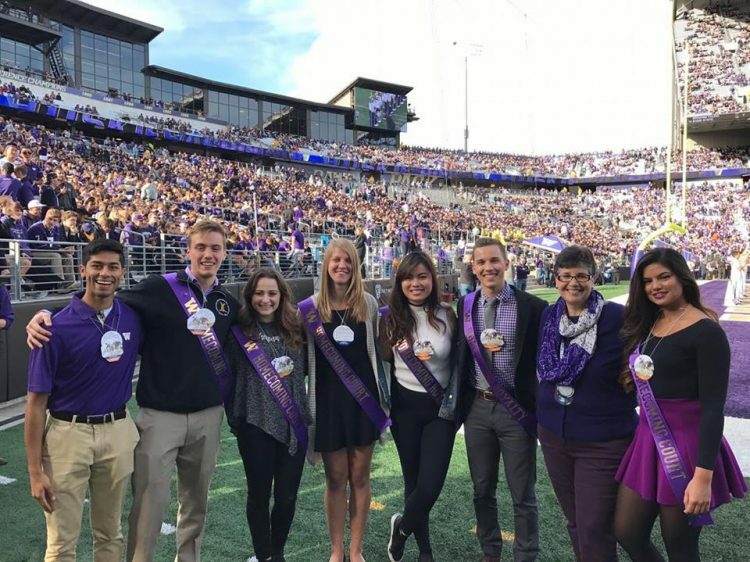 At first, they start out small, learning the ropes of how the organizations operate, making connections across campus, and then as they settle into their new roles, really flourish and make lasting impacts at UW. Many of you probably remember this experience yourselves. In fact, Winter Quarter is often when the proverbial “light bulbs” go off and that is exactly what we are seeing right now. Student leaders are hitting their strides of confidence, planning some incredible programs, building off their campus connections, and advocating for campus resources, both locally on campus and across the state. 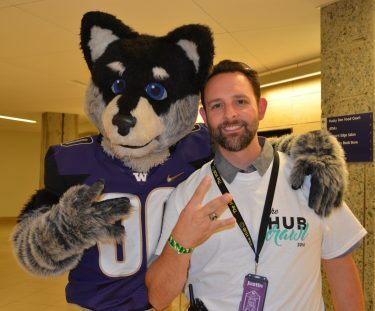 Enjoy this edition of the HUB Alumni Newsletter, reading about several of these incredible student leaders and their programs, as well as more great ways for you as alumni to develop deeper connections with these students through Huskies @ Work and UW Giving Day. Hey, y’all. Some people ask me how I am able to keep up with what’s happening in the lives of former students, and while I wish I could declare it is due to a brilliant and diligent mind, it really is aided by things like holiday cards, birth announcements and such. Thankfully, this is magnified in useful ways through the lens of social media platforms like Instagram and Facebook. I truly wish you were able to see the bulletin board in my office. About a month ago I put up a whole bunch of holiday/picture cards from some the former student leaders with whom I’ve had the opportunity to work and advise. It brings me such joy and gratitude to receive these each year and to have a small glimpse into your lives. I truly enjoy seeing and learning about jobs, relationships, children, family moments, travel…and even pets. If you’re near the HUB, you should definitely stop by so I can share and brag about our marvelous GPSS and ASUW alumni family. What was your most memorable UW class? Well, I can’t single it out to one. I took all of the best classes, and zeroed in on all of the best instructors. One of the best classes I took was Modern English History with Giovanni Costigan. From my research, Dr. Costigan was the greatest history teacher in the world. He was a delight; he was magnificent. Another one of my favorite classes was Washington State Geology with Larry Hanson. It was a huge lecture hall, and we broke up into groups and did field trips all the time. I have many heros, because there are a lot of fabulous people out there. Franklin Roosevelt, Theodore Roosevelt, JFK, and Aldo Leopold are a few of my heros. Leopold was an American ecologist and wrote one of the greatest books ever written in America, A Sand County Almanac. What would be your go-to karaoke song? “I’m Not Like Everybody Else” by Ray Davies of the Kinks. I think Ray Davies is the greatest Rock ‘n Roller. He is responsible for the soundtrack of my generation’s life. About ten of his songs are just spot on. What is your favorite Husky football game day tradition? Winning. I love winning. I especially love conquering any team from Southern California; I cheer for all Northwest teams. 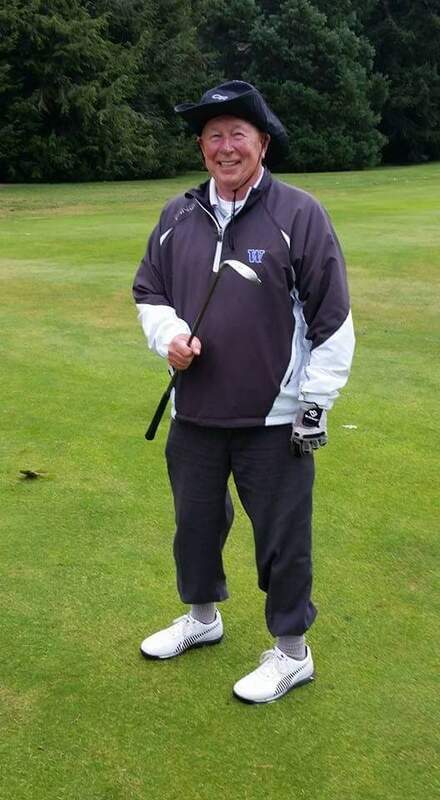 I’m pretty happy with our coach (Chris Petersen), but our former coach, Don James, was a great coach. He was also one of my heros. What is your favorite memory of the HUB? I had an office on the second floor that was a great base. I got to know a number of really great people from working at the HUB. Those associations, you never forget. They are a part of you forever. What are your goals as VP of External Affairs? My primary objective as Vice President of External Affairs is to make graduate and professional students a bigger part of the higher education conversations taking place on and off campus. I am extremely passionate about highlighting the importance of graduate education because we provide education to our undergraduate students, ground-breaking research to our university, and a boost to our local and state economies. Graduate and professional students are a vital part of all Washington State college’s and we deserve to have our voices heard by our administration and our state legislators. In what ways has the HUB contributed to your Husky Experience? I was lucky enough to experience the new HUB right after it was completed when I was a senior in undergrad. Having the privilege to work here as a graduate student with GPSS has been such a dream because I am always surrounded by the most spirited Huskies who inspire me to do great work. If you had to eat a single food for the rest of your life, what would it be? Definitely pizza, no question about it. Anyone who knows me would say that I’m a pizza fanatic, especially when it’s pepperoni with jalapeños. I feel like my dream job changes daily as I’m exposed to so many new opportunities and experiences. Today it would have to be working with UW State Relations and advocating on a larger platform for my university. Do you have any Husky Game Day traditions? If so, what? Whether I’m watching the game at the stadium or on my couch I always wear my favorite Husky crewneck! My rescue dog Penny is also a pretty big fan so of course she wears a matching Husky jersey. 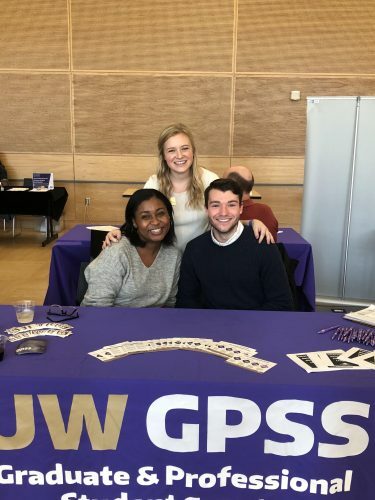 On October 18, the Graduate and Professional Student Senate (GPSS) partnered with Core Programs (Office of Graduate Student Affairs) to host UW’s first-ever GPSS Resource Fair. 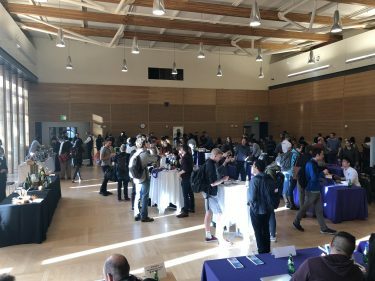 Held in the HUB Lyceum, the fair provided tabling services as well as refreshments, entertainment, and free swag for the 300 graduate and professional students who attended the event. Talks about organizing a fair commenced the previous year after the Graduate Student Service Committee conducted a survey on graduate students’ Husky Experiences. Based on participant feedback, it was evident that a universal graduate and professional student orientation needed to be established. Due to the combined efforts of almost all 14 GPSS officers and staff as well as Core Program’s student outreach and departmental connections, a grand total of 26 resources were made available to Resource Fair attendees (20 of which were specifically tailored to graduate students). “The Resource Fair was a way for students to network and meet each other, but also get them to meet these different resources. This was the first year we did it, and it was very successful which was really exciting to see” said Sydney Pearce, GPSS Vice President of Internal Affairs. As a result of the 2018 Resource Fair’s high attendance rate and overwhelmingly positive remarks from UW resource representatives, GPSS will, once again, be sponsoring the event in the fall. To accommodate more organizations and participating students, GPSS hopes to increase next year’s hours and move the fair to a larger event space. 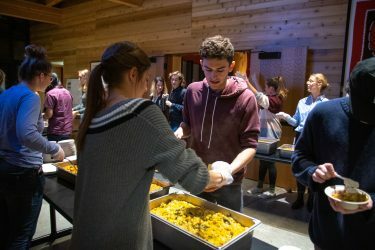 On November 16, the ASUW Student Food Cooperative (SFC) celebrated its annual Fall Humble Feast in the University of Washington’s Intellectual House. This year, nearly 250 students and faculty dined together in support of affordable, locally-sourced, ethically produced food. Cooked and served entirely by ASUW SFC and student volunteers, the four-course meal consisted of butternut, cauliflower, chickpea curry, roasted fall vegetable salad, dal, and cardamom apple cake. 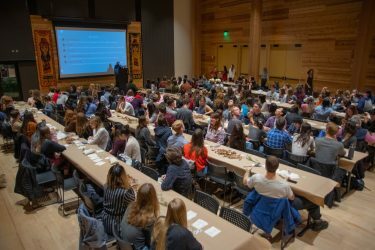 Since its inaugural event seven years ago, the ASUW SFC Humble Feast has continued to successfully unite the UW community through informative dining experiences that explore the food system and sustainable living. In order to execute the large-scale event, ASUW SFC started coordinating Humble Feast before the start of the academic school year. To ensure the meal would be fresh and accommodating to vegan and/or gluten-free attendees, ASUW SFC researched seasonally available products and tested a myriad of recipes. During the week of the event, the team also gathered ingredients from PCC Community Markets and Central Co-op, garnered proof of workers’ food handling permits, and spent three days cooking in the HUB kitchen. Aside from enjoying a hearty meal, Humble Feast attendees bonded over shared food interests while listening to student groups lead conversations around various food beliefs (e.g. Huskies for Food Justice, Campus Animal Rights Educators, UW Farm, and Campus Sustainability Fund). Throughout the course of the evening, slide presentations also worked to inform attendees of need-to-know nutrition and production facts. Looking ahead, organizers of the Spring Humble Feast hope to continue generating dialogue by procuring a guest speaker to head an educational forum around indigenous food sovereignty. In honor of the the Office of Minority Affairs & Diversity’s (OMA&D) 50th anniversary, the HUB is currently showcasing Revolution & Evolution, a historical exhibit reflecting the resilient voices and actions taken by the Black Student Union. 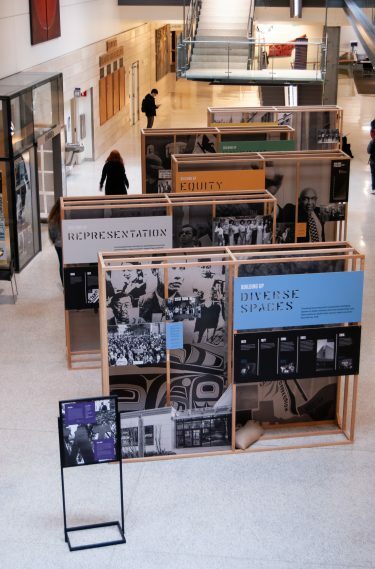 In 1968, the OMA&D emerged as a direct result of a BSU sit-in that challenged the mistreatment of minorities and advocated for equal representation and inclusion at the University of Washington. Since its establishment, the OMA&D has worked to increase the number of minority, low-income, and first-generation students on campus and support them in their academic and professional pursuits. Stationed in the HUB Street throughout Winter Quarter, Revolution and Evolution embodies existing educational barriers that reflect the five demands issued by the BSU fifty years ago. In partnering with UW Professor Kristine Matthew’s design studio, Studio Matthews, as well as Professor Matthew’s Design 465: Exhibition and Installation Design class, the OMA&D has successfully cultivated awareness and conversation regarding diversity, equity, and community. By acknowledging past hurdles and subsequent triumphs, the OMA&D hopes to instill faith in UW students’ ability to overcome hardship by embracing their strengths. In working together to build an inclusive and compassionate community, students will find the support they need in order to succeed and feel fulfilled. As you will read about below, ASUW and GPSS both had successful elections last Spring. As the groups returned this Fall, they kicked-off the year with fresh new training programs. ASUW expanded to a weeklong intensive training for their entire organization, and I can say this has been paying off in dividends. These efforts go right alongside an entirely new RSO registration process and student leader-training program being developing by the Student Activities Office. The HUB staff are making significant shifts to provide high caliber support for our students today and for their futures beyond graduation when they too join the HUB Alumni Network. Speaking of such, I hope that all of you are aware of the HUB Fund for Leadership in Excellence. Starting this year, we are switching gears and have a goal to endow several scholarships through this fund. We have so many incredible students who leave indelible marks on the UW campus and soon the HUB will help provide some of these students better access to their education through a scholarship that recognizes their leadership contributions. I hope that you will help us make that a reality. Finally, last year we brought on a new staff member, Adam Serafin, as our Assistant Director for Communications & Development. Along with this year’s Intern, Alison Day, Adam will be developing more ways for us to engage with all of you and for you to engage with the current students. We are so very excited to build upon the engagement with the HUB Alumni Network that has grown over the past decade! Let me start off by staying – I’m still here and not going anywhere. 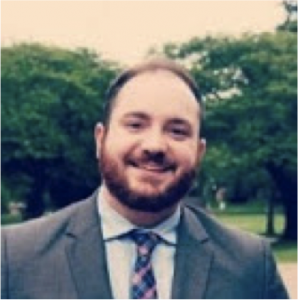 Yet, the time has come to initiate the transition of the HUB Alumni Network into the extremely capable hands of Justin Camputaro, the Director of the HUB, who has now been in his role for 2.5 years. He has fully embraced the alumni work that we have created and is excited to build upon the successes we’ve had over the last 10+ years. The work will be greatly benefited by the support and assistance of Rene Singleton, Assistant Director for Student Activities, and Adam Serafin, Assistant Director for Communications & Development. And since I’m not going anywhere, all of us will continue to work collaboratively on our outreach and cultivation with the HUB Alumni Network. Let me say loudly and proudly: I remain committed to this important and inspiring work and the many, many relationships we’ve built since my arrival 22 years ago. I look forward to staying in touch with you over the coming months. Be well, y’all. PS: If you’re interested in the “Bubba” reference, perhaps I can use a future newsletter to illuminate its origins; hint: it involves ASUW Board meetings. 1. What are your goals as Director of Community Relations? My role in ASUW allows me to collaborate with students from all over campus. I’m really fortunate that I get to help other student leaders put on effective programming and critically think about how they can advocate for their constituents. Within my term, I hope to have a joint-programming event across all living communities and I hope to encourage participation in Student Senate from underrepresented communities. 2. In what ways has the HUB contributed to your Husky Experience? When I am at the HUB, I am meeting with friends to discuss what we can do as student leaders on behalf of our constituents to make the campus a better place. As I am finishing my last term serving on Panhellenic, the Office of Fraternity and Sorority Life has become a second home to me. Serving as this year’s Director of Community Relations, I am also thrilled be apart of ASUW’s space, where I can continue to drive change on campus! 3. If you had to eat a single food for the rest of your life, what would it be? I’m a huge burger fan. I have a weird obsession with burgers. Any type, too. So, if I could just have a different type of burger for every meal of the rest of my life, that could be fun! But, if I had to narrow it down, I’d probably stick to a classic bacon cheeseburger! I have a passion for health. As a Medical Anthropology and Global Health major, I love learning about people’s ways of living and am constantly intrigued by how different parts of the world perceive and prioritize healthcare. I would love a job where I could work within the healthcare realm and apply the leadership skills that I have developed at UW! 5. Do you have any Husky Game Day traditions? If so, what? I go to all of the Husky games with girls from my chapter! For me, Dawg Saturdays and basketball games are times when I can celebrate the school with some of my best friends! 1. What was your most memorable UW class? I had many at UW. However, one that stands out is Political Science 101, as we dissected “Lord of the Flies” as a metaphor for civilization. When I used to do labor negotiations, I would mentally categorize people Jack Merridew or Ralph to determine how to approach them. 2. Who is your hero? Why? Teddy Roosevelt. He possessed a remarkable intellect and was a renaissance man – as adept at hunting as he was at writing. His life was constant motion and adventure, tragedy and triumph were his companions. He was often out of place, way ahead of his time, yet incredibly productive as if he was in on a secret that few knew. He was a remarkable human being who inspires me to be more productive. 3. What would be your go-to karaoke song? Creep by Radiohead. I came of age in 1990s, so I love the splendid darkness of grunge music. 4. What is your favorite Husky football game day tradition? An enormous mountain of fresh fruit on top of pancakes at Portage Bay in Roosevelt Avenue! 5. What has been your favorite memory of the HUB? It’s more a feeling than a memory. The HUB was the one spot on campus where students ran the show. I remember it as a place full of hope and great expectations. This past spring, a new team of inspiring and enthusiastic students were slated as candidates in the 2018-2019 ASUW and GPSS elections. Campaigning for the ASUW election commenced two weeks prior to the voting period and successfully garnered support from a large number of UW community members. As always, there were many promising candidates. This year, the ASUW Board of Directors elected officers include Ritika Jain (President), Espen Scheuer (Vice President), Andrew Tejero (Campus Partnerships), Gabby Rivera (Community Relations), Favour Orji (Diversity Efforts), Casey Duff (Internal Policy), Jack Hood (Programming), and Angelia Miranda (University Affairs). The new officers have vowed to build community following the principles of inclusion, transparency, and cohesion. Moreover, these individuals are dedicated to bringing ASUW back to its roots of student activism and involvement. Exactly one week prior to ASUW elections, GPSS held its own electoral race. After a well-fought battle between deserving candidates, the following individuals triumphed: Giuliana Conti (President), Sydney Pearce (Vice President Internal), Kelsey Hood (Vice President External), Amy Gabriel (Secretary), and Robby Perkins-High (Treasurer). Collectively, the GPSS Board of Directors is dedicated to bringing leadership and commitment to the UW graduate community. In honor of the incoming and outgoing ASUW and GPSS Board of Directors, an inauguration celebration was held at the HUB this Spring. Joined by ASUW and GPSS alumni leaders, the UW community ceremoniously embraced the newly elected officers into their positions and congratulated graduating seniors as they transitioned into the HUB’s growing alumni network. Many of the incoming officers used inauguration to forge relationships with their predecessors and gather insight on how to be impactful representatives of the student body using their newfound voice and positionality. Similarly, outgoing officers capitalized on the opportunity to develop ties with alumni from a variety of professional backgrounds. 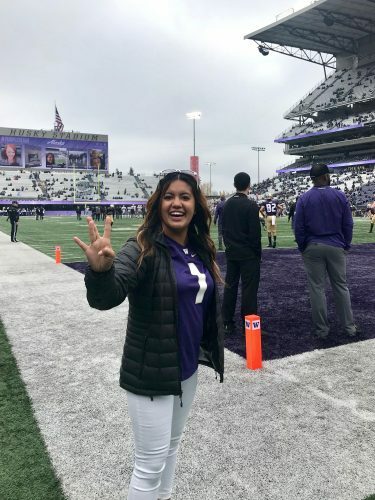 As past student leaders mingled with UW’s emerging change agents, one thing become evidently clear to those attending the second annual inaugural event: Once a Husky, always a Husky. 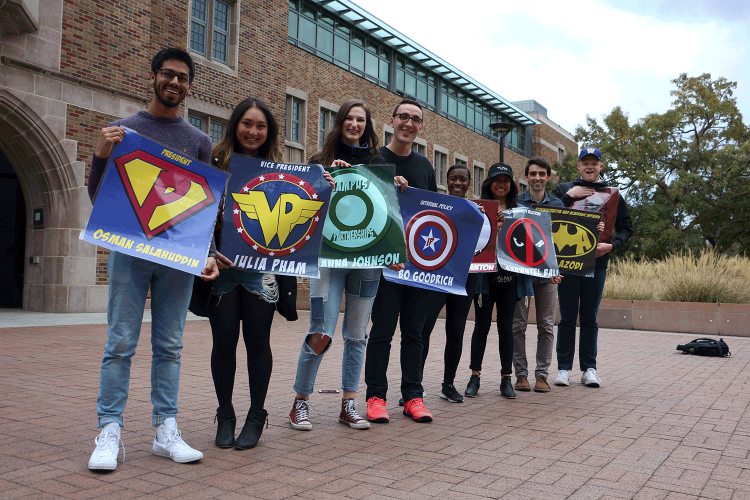 In preparation for the 2018 midterm elections, UW student leaders rallied together in an effort to drive voter registration and turnout. According to Nick Peda, Organizing Coordinator for ASUW’s Office of Government Relations (OGR), roughly 500 individuals filled out registration forms as a direct result of organized outreach efforts urging students to vote. In addition to forging a strong partnership with the Residential Community Student Association, the OGR tabled and distributed flyers for multiple days on campus, ran a successful social media campaign, and facilitated a “Rock the Vote” event in collaboration with GPSS on the HUB Lawn. Compared to previous years, ASUW devoted more of their efforts towards actively encouraging students to vote rather than merely registering. Peda acknowledges that students often forget to vote due to hectic schedules/busy lifestyles or simply choose not to vote because of lack of trust in the system. 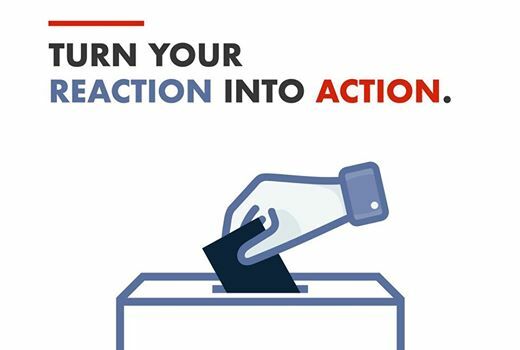 With these voting barriers in mind, Peda shared, “The biggest thing we can do to get students to vote is to really bring to mind the issues that they care about and convince them that they can actually effect change. Individual votes are very, very important.” As a whole, students interested in politics are presented with numerous opportunities to get involved and propel change within the UW community, such as through one of the many registered student organizations, work-study options, or ASUW programs. 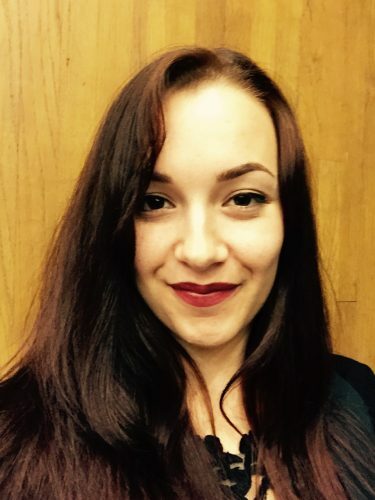 Join the HUB in welcoming Alison Day to the team! This academic year, Alison will be graduating with dual degrees in Communication and Education as well as a Minor in Diversity. 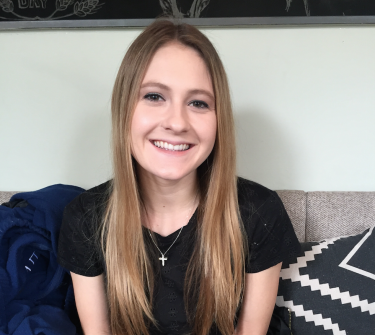 As an intern, Alison will be working to foster community growth and student engagement at the HUB. 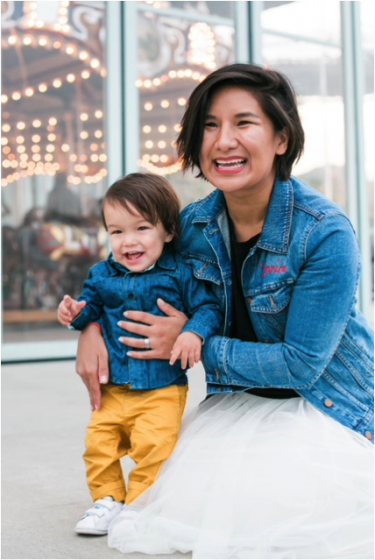 In addition to creating, coordinating, and executing events and programs, Alison will also play a pivotal role in maintaining alumni relations. 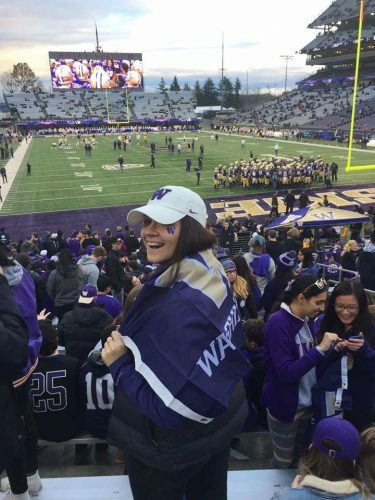 As an out-of-state student, Alison was drawn to the HUB and its mission to create meaningful experiences for students at UW. 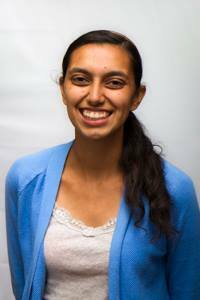 She looks forward to being a part of the dynamic team behind many of UW students’ favorites Husky Experiences. The end of the school year is upon us yet again and I can’t help but reflect on the amazing opportunity my colleagues and I have working with ASUW and GPSS student leaders. It is quite humbling…and exhausting at times…but such an honor. The conclusion of the year means that leadership transitions are underway. We will truly miss the student leaders who are concluding their year of leadership and service and preparing for a happy and successful life beyond UW; we wish them the best as they embark on their next phase of life. While we say farewell to this year’s leaders, we are excitedly welcoming the ASUW and GPSS leaders for 2018-19. As we have done for generations, HUB staff and administration continue to stand alongside and partner with ASUW and GPSS leaders to continue their growth as individuals, pursue their organizational goals, and enhance the experience for our student community. With the incoming group of leaders, I have this annoying tendency of frequently reminding them that they are not in this alone. We want them to always know that they are a part of a rich tradition and tapestry of former student leaders and I know that they appreciate and respect the legacies you have left behind. Enjoy this edition of the HUB Alumni newsletter…and please let us hear from you. We love getting little notes and emails about your life and work. Being one of the first students to start the UW Dream Project before it became an established UW program. If you look closely at the logo I’m the second silhouette from the right. My mom is my shero. She’s a resilient woman from who I have learned a lot from and has also given up a lot for me and my sisters success. 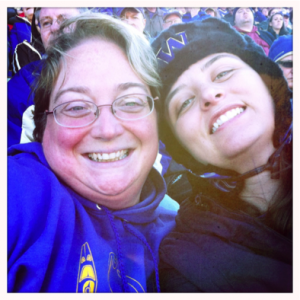 Being at Husky stadium when the two sides of the field call out “Go Huskies!” back and forth. The call and response effect was always so much fun. Before the HUB was renovated, being on the second floor for election results and learning that I won the position of Director of Diversity Efforts. I spent less than $30 on my campaign and ran as an independent. 1. What is your role? What is your favorite thing about your role? 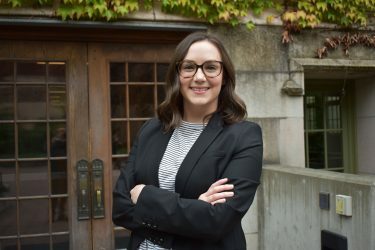 I was elected Secretary of GPSS for this academic school year and while there are a myriad of responsibilities under my purview, my favorite part of being Secretary is working toward enhancing and advocating for diversity within our organization and graduate and professional students at UW. 2. What has been your favorite memory in the HUB? My favorite memory so far is not really a particular event, more like the energy that fills a room when small or large groups of people gather for a common goal. I feel this in our office when a lot of our staff, officers, exec members, and graduate students are hanging out and working together; and I feel it during Senate meetings when representatives of over 50 departments meet to make collective decisions that better our experiences on campus. We are lucky to have the space for these gatherings to be realized. Oh, easy. Pasta. Or any bread product, really. I grew up with my dad’s Italian cooking so I’ve basically already satisfied the “rest of my life” goal since I continue to eat bread and pasta regularly! My dream job would be an environment where I’m surrounded by like-minded, public service-oriented people that advocate for the advancement of education, especially music education. I think academia is a special place filled with intelligent, intellectual, passionate, over-achievers with an immense capacity and drive for change; I would love to stay as close to academia as I can, with maybe a side of policy reform and/or elementary teaching. Yeah, so I probably shouldn’t admit this, but I’m not much of a sports person…I am however in the arts, so music performances tend to be my jam. For these I usually call/text whoever I can think of to rally them into joining me, and then going out for drinks after the performance to celebrate. I totally support people’s love of sports, but I also encourage everyone to check their local concert listings! Students, staff, and faculty filled the HUB Lyceum on February 8th and 9th to hear experiences shared by a group of brave women, trans*, gender non-conforming, and genderqueer individuals. The stories were about personal moments of resistance, identity, and survival experienced by the performers. A range of topics were explored, such as gender identity, religion, bodies, minds, activism, race, ethnicity, sexual orientation, and many more. The goal of the ASUW Womxn’s Action Commission’s flagship event was to “deconstruct” the identity of a woman, and to leave attendees with a feeling of pride in the power of individuals. For Brittany Wu, the president of the Womxn’s Action Commission, this event is more than just a performance. 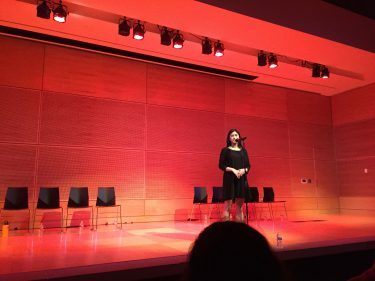 To her, participation in The _______ Monologues was more important than the event itself, as the goal was for the performers to feel empowered during their moments of vulnerability. “As the director, knowing that a student can make this big of a difference feels incredible, and I’m so glad that around 350 people got to have insight on 9 of thousands of breathtaking stories held by UW students,” shared Brittney. From the response and feedback heard regarding this event, the hours upon hours of planning and organizing by the Womxn’s Action Commission shined through in the final product. A few months ago, the ASUW Pacific Islander Student Commission began preparation for their quarterly event that occurred on January 31st, Pasifik Voices. This event was founded in 2009 by Kiana Fuega and Christina Pelesasa with the intention to provide a public space for Pasifik poet Sia Figel to present her work to the UW community. When the Pacific Islander Student Commission noticed the positive reaction from students at UW, they opened up the floor to all students willing to present their talents through music, art, spoken word, dance and much more. This event, both then and now, celebrates the diversity of Pasifik Islander representation throughout our campus and the surrounding area, and aims connect this passionate community of students and the wider UW population through a night of cultural expression. Since the Pacific Islander Student Commission consists of a variety of clubs, there was a significant amount of representation for all corners of campus. The Polynesian Student Alliance and Micronesian Islands Club were the master of ceremonies for the event, and the performers represented the Hui Hoaloha ‘Ulana (Hawaii Club), Filipino American Student Association, and the Filipino Association for Health Careers, just to name a few. To make the event more accessible, community member Lokeni Tiatia volunteered her time to provide an ASL interpretation. Katrina S. Punzalan, Pacific Islander Student Commission Director shared, “People don’t always understand who Pacific Islanders are, so we hope that this event could allow the community to express themselves accurately so that the UW community can have a better understanding and gear away from any stereotypes that may exist.” The sense of community in the room was also very exciting for Punzalan, as this year even more individuals on campus could experience the talents of the Pacific Islander community. 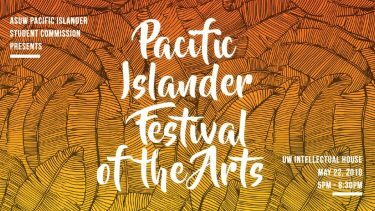 This Spring, in place of Pasifik Voices, the Pacific Islander Student Commission hosted the Pacific Islander Festival of the Arts at the Intellectual House. The festival showcased community artists, both visual and performance, in an effort to highlight the vast Pacific Islander art and presence in the community inside and outside the UW. University of Washington students were invited to join ASUW and GPSS leaders on January 29th as they challenged our state legislative system with current affairs. 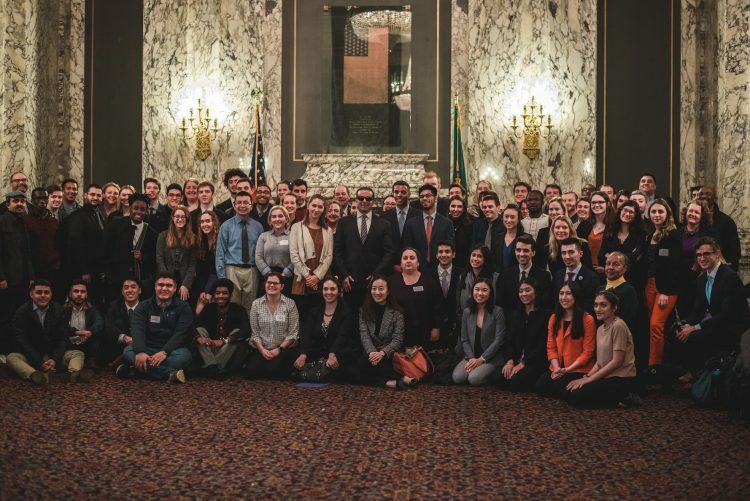 This event, dubbed Huskies on Hill, provided UW students the opportunity travel to Olympia and lobby on behalf of student issues. Planning for this event began in early December, which allowed the ASUW Office of Government Relations to assemble community members who were willing to bring forth a conversation with their legislators about how to better support issues regarding their higher education experience. These topics included tuition and textbook costs, mental health resources, sexual assault protections, and disability inclusion and accessibility on campus. Through word of mouth, social media, and physical posters, the Office of Government Relations was able to recruit 150 students to join their lobbying efforts. 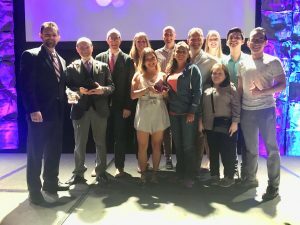 Partnering with the Tacoma and Bothell campuses increased the total amount of participants and united the University of Washington community under a common cause. With that many individuals comes an immense amount of logistical planning, as 97 individual meetings were set up to ensure the face to face communication between UW students and legislative officials. When asking Kalani Tissot, the Legislative Programming Coordinator, about his favorite aspect of the event, he shared that it was “providing students an opportunity to meet with the Governor and Lieutenant governor of Washington.” The opportunity has given UW students a voice and a platform to change our community for the better. Keeping a brand fresh and exciting is not an easy task. ASUW has recently tackled that challenge and has undergone a rebrand. This change was initiated by the ASUW Office of Communications at the beginning of April. Through interviewing a student focus group, the Association was able to pinpoint areas of improvement in the ASUW’s current brand. What they found was that the Association’s brand lacked cohesion and did not accurately represent its mission. With the help of ASUW’s Visual Designers, the new brand guidelines better represent the Association and have more appeal to students. Brittany Pham, ASUW’s Communications Director, suggested that, the “rebrand was focused on reinventing the perception of ASUW through the logo and brand and to engage with students by showing them the opportunities offered through ASUW.” Check out ASUW’s website to see the outcome of this creative endeavor! A very belated happy new year, y’all, and welcome to the latest edition of the HUB Alumni newsletter. We have reached the time of the quarter where you can see the anxiety and looks of worry on the faces of students. Whether related to finals, research papers, the challenges of everyday life, a break-up, or the grey skies, our hearts certainly go out to our student leaders. We just wish we could fix everything for them, but the world of student development is all about challenge and support so we do our best to be present and provide resources that help our students navigate through the ebb and flow of these experiences. What impresses me is how much grit, ambition, resilience, and diligence our student leaders bring to their school work (most importantly, of course) and their roles with ASUW and GPSS. As for the student union, the HUB continues to grow at the seams. Once you enter the doors, you will soon hear the verve and flow of conversations, piano playing, friends comparing notes on their latest Netflix favorites, and study groups working together to solve the woes of our world. It’s exactly what was envisioned when ASUW and GPSS advocated for and helped accomplish the renovation. The HUB continues to serve as the community center for campus and we are humbled by this. 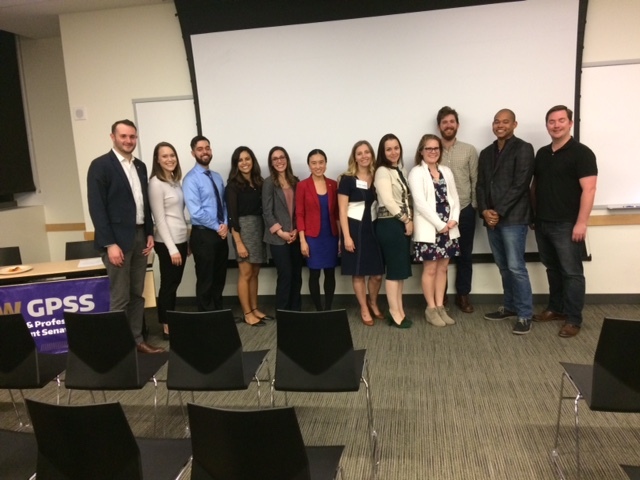 The HUB Alumni network continues to grow each year and we so appreciate your participation, support, and interest in this amazing yet critical work with ASUW and GPSS leaders. Let us hear from you. I welcome your emails and updates. It also helps me connect students with the individuals who came before them and blazed the trail of student advocacy and service to the campus community. 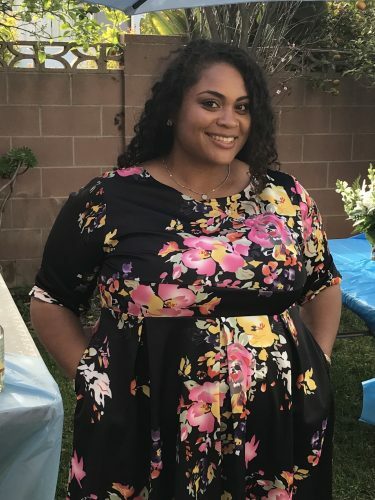 Lastly, this newsletter was organized and written by this year’s HUB Alumni Intern, Marissa Greitzer, a senior studying Education and Sociology. We hope you enjoy it. I took an independent study comparative literature class with Willis Konick when I was at the UW. I had taken a number of his films courses by that time, and like every other student who took those classes, immediately fell in love with his active and engaging teaching style. It was an honor to work with him one-on-one while studying works by Fyodor Dostoyevsky. Professor Konick helped improve my ability to think critically and creatively, and also helped me realize how much I loved literature. Perhaps even more importantly, he was always kind, supportive, and rooted for me to succeed at the UW, academically and beyond. 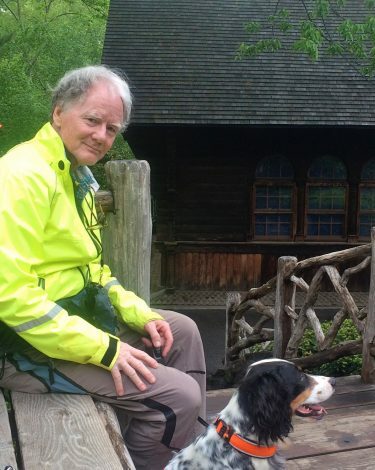 In retrospect, some of the most significant lessons I learned during college happened in courses like his – classes that I initially took only for “fun” because I had a personal interest in the subject matter. I was devastated to learn that Professor Konick passed away a couple of years ago. My heroes are all of those who have stepped up to fight for immigrants, people of color, women, and all of those whose fundamental rights have been threatened. I am a pretty terrible singer, yet I do not fear a karaoke mic. I don’t have a specific go-to song, but my go-to genre would be any late 90s/early 2000s pop or rock: Pearl Jam, Green Day, TLC, En Vogue, Britney Spears, Backstreet Boys, etc., etc. I should have some shame about my continued love for this type of music, but I do not. Making my family wear Husky gear on every game day even though we live in NYC. My 2 year old can really rock that purple and gold like nobody’s business. I think it’s because of his 100% Husky lineage. Meeting my husband, as well as some people who remain close friends more than 15 years after I graduated, through my time in student government are my favorite memories of the HUB. Being surrounded by people who truly wanted to be a part of a community and wanted to work toward making the UW and the world a better place was a magical time for me. When I visit the HUB my heart instantly fills with love and fond memories, as well as the hope that there continue to be many students who have positive, life-changing experiences like mine during their time at the HUB. 1. What’s your role, and how did you get involved with ASUW? My role is Senate Speaker! I got involved as a Senator last year. My day-to-day work varies depending on the day of the week, but I generally spend the earlier part of the week sending out emails to keep Senators looped into the plans for the coming week, along with other happenings around the association. Then, after planning, I run the Senate meetings, which is two hours of ensuring that everyone is following proper meeting procedure, and making sure that a room of 75 students is as respectful as possible. The rest of the week involves meeting with other members of the association to see what they may need in terms of support for writing or following up on legislation. As Speaker, it’s also my job to follow-up on legislation that the Senate passes. So the end of my week is writing emails to individuals who can take action on Senate legislation, whether that be legislators, University administration, or other colleagues in ASUW. 2.What’s your favorite part about working in the HUB? My favorite part about working in the HUB is having a home away from home. It’s not necessarily the resources of the HUB as a building that are the most beneficial to me, but the support of my coworkers and everyone in the Student Activities Office. My team, Madison, Nick, and Alec, are near and dear to my heart. Without their hard work and friendship, the HUB wouldn’t be the same for me. Because of the compassionate and driven individuals involved with the Association, the HUB is a home for me. I know that every time I walk into the HUB, I am walking into a space full of people that I know will have my back. While there is admittedly a culture of overworking ourselves, it’s the support systems we share that make our work much easier. 3. What’s the biggest challenge you have faced in your role? The biggest challenge I’ve faced in my role is trying to keep organized and make sure everyone is on the same page. Delegating tasks hasn’t always been my strong suit, but because I’m the entity director I’ve had to learn how to spread the work amongst my teammates. I’ve also learned how to ask for help more, which has been really helpful. 4. If you could travel anywhere in the world, where would it be and why? I’d go to Japan, because I love visiting my family and friends there. 5. What’s your favorite TV show at the moment? My favorite TV show is Sense8! On November 17, 2017, ASUW’s Middle Eastern Student Commission held their first annual Professional Development Night. Students and professionals of Middle Eastern and Muslim origin gathered in Kane Hall to learn about opportunities in various fields. Numerous UW Alumni returned to campus to share their stories with those attending the event, thus creating a networking opportunity for students. 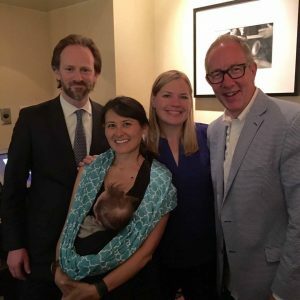 The planning for this event began in Summer 2017, with the intention of highlighting experienced individuals in the Seattle area. By reaching out to alumni, Middle Eastern Student Commission Director, Mennah El-Gammal, felt that UW students would then envision themselves in the global workforce. “It’s hard for them to have a positive image of themselves, and a lack of representation can affect what they imagine to be possible. 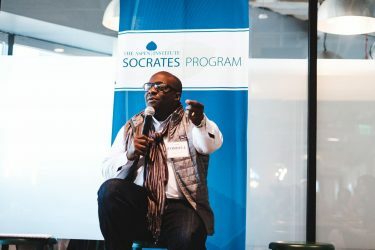 Essentially, who is heard and seen, and who is not defines the status quo, and with that in mind our team developed and executed on this event,” says El-Gammal. 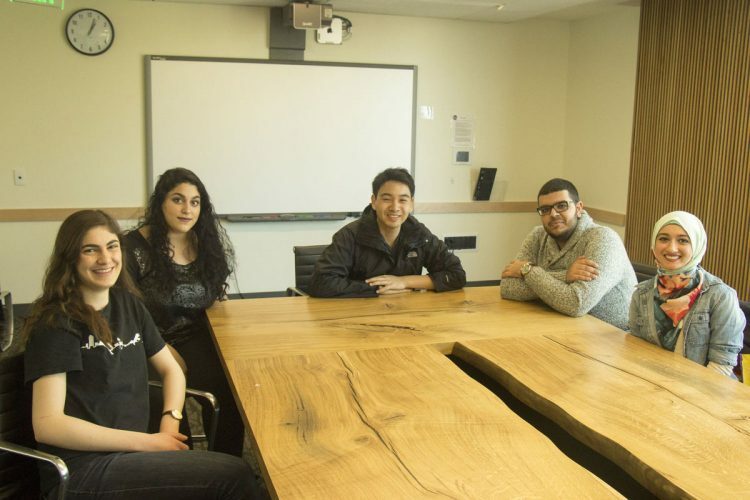 The lack of representation of professionals with Middle Eastern and Muslim origin has been expressed by many minority students in their community. The night was a success, with a hundred students attending the event. El-Gammal hopes that this can transform into an annual occasion so that students can continue their academic pursuit with the confirmation that their efforts will not go unnoticed in the future. 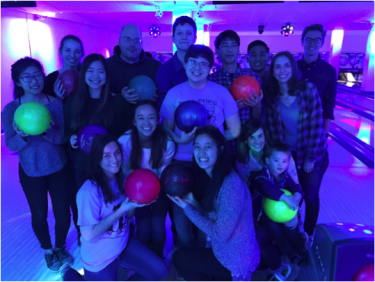 Two on-campus clubs partnered with the HUB Games Area to host a fundraiser for Kiwanis Camp Casey last November. 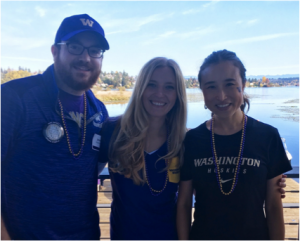 PediaPUPS, UW’s Student Pediatric Pharmacy Advocacy Group, and Rho Chi, UW’s chapter of the International Honor Society in Pharmacy, collaborated for this cause. Kiwanis Camp Casey is a free summer camp for children with physical disabilities where they can spend a week doing fun activities and building friendships with other children who also face similar challenges. With the help of The North Central Seattle Kiwanis Club and the money raised during this event, PediaPUPS and Rho Chi will be able to fund campers to attend Camp Casey this summer. The clubs are made up of students whose future careers will be maintaining the physical well-being of individuals, so each association is passionate about the cause. The fundraising event consisted of two components, a raffle drawing and bowling. Raffle tickets were donated by businesses in Seattle, such as Paint the Town, Jet City Improv, and DoodleBug Sportz. The student organizations raised nearly $500 to donate to Camp Casey. In 2001, Rainy Dawg Radio was created to not only entertain the students, faculty, and staff of UW, but to generate a scholastic outlet for UW students who are interested in the music and broadcast industry. This means of communication allows students to practice reaching and relating to a campus-wide audience, while enjoying a moment away from their tough academic lives. Last quarter, Rainy Dawg expanded their programming quality by hiring more individuals as DJs. With a total of 105 DJs, the sound has been more diverse and relevant to everyone in the UW community. In addition, Rainy Dawg held their Local Music Show at the Ethnic Cultural Theater this past November. 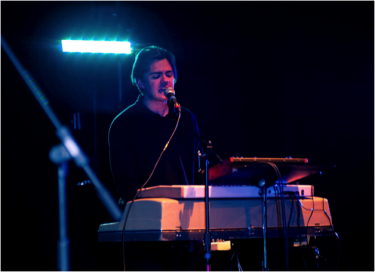 The free event featured bands from the Seattle area and the student leadership is planning to host more shows as the year continues. One of Rainy Dawg’s goals is to discover more ways for the station to better collaborate with the community, both inside and outside of UW. At the beginning of January, Rainy Dawg invited volunteers who share a similar passion for music to connect with members of the staff. The leadership feels that it will strengthen their community by growing and developing its membership. Dominika Morawski, Director of Rainy Dawg, shared, “I hope that Rainy Dawg will be large enough to bring more influential artists that can relate to and inspire a much larger group within the UW community.” Not only does this station connect with members of the UW community, but also maintains a relationship with local promoters, musicians, and concert venues Seattle that bring joy to all music lovers. On September 5, 2017, the Graduate and Professional Student Senate (GPSS) held their 4th annual Husky Sunrise on Rainier Vista to welcome new and returning graduate and professional students. This year’s event featured a delicious breakfast, mimosas, and the opportunity to mingle with Deans, faculty, and students from a variety of academic disciplines. Students were also able to learn about many of the resources for graduate and professional students at the campus resource fair. According to one attendee, “it was a great way to be introduced to campus. I didn’t know anyone and was nervous, but everyone was in the same situation and it was a very easygoing event.” It was exciting to see students, deans, faculty, and administrators come together with the sole purpose of meeting new friends and enhancing a sense of community at UW. Yeun Elloise Kim, who is in her second year as GPSS President said that the event “brimmed with a feeling of excitement and offered a setting where students supported each other and celebrated each other’s splendid achievements.” GPSS continues to be proud of hosting this annual event and is thankful for the campus departments who provide the generous support for it. Congratulations to the ASUW and GPSS students who graduated this year. If you know me in any sort of way, you won’t be surprised that I get a little wistful when the school year reaches its conclusion. Those of us who work with, advise, and mentor students from GPSS and ASUW put so much of our hearts and minds into building these interactions and relationships that we experience a sense of loss when our students graduate or choose to get involved with other opportunities on campus beyond ASUW and GPSS. Don’t get me wrong — I am beyond thrilled to witness this grand moment (for them and their families), but I am really going to miss so many of them. All I can hope for if that they remain in touch with us over the coming months and years. We truly invested in their success beyond UW. Enjoy this edition of the HUB Alumni newsletter. 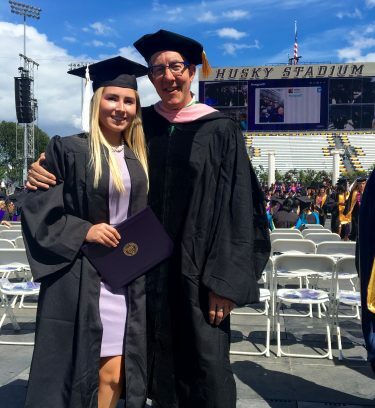 My deepest appreciation and gratitude goes to Stacey Hurwitz (pictured) who just graduated from UW and is moving to the east coast to start her professional career. For two years, Stacey served as the HUB Alumni Intern and was instrumental in our alumni efforts. She wrote two years of newsletters, helped plan alumni events, and enhanced our alumni efforts during her tenure. Thank you, Stacey. You will be missed. Have a wonderful summer, y’all. ASUW and GPSS elections are held in May of each school year and they are exciting times for student government at UW. This year, ASUW held their elections May 8-10, and GPSS held their elections on May 17 and May 31. ASUW elections were announced on Thursday, May 11, on the front porch of the HUB. 4,718 students voted in this year’s election (approximately 15% of the undergraduate population) which exceeded last year’s voter turnout. There were two students who waged a campaign for President and Vice President, in addition to one complete “ticket” for this year. That ticket, “Husky Purpose,” celebrated their victory that evening due to the announcement that their candidates won every position. 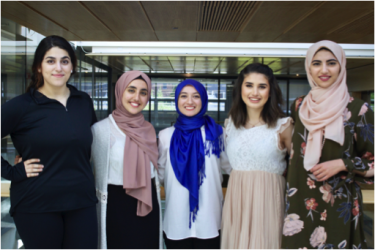 The 2017-18 ASUW President, Osman Salahuddin, notes that “it was so fun engaging with students…now it has culminated into this one awesome time where the entire team won, and I am just really excited to serve the campus community!” Husky Purpose’s platform was “Empower. Engage. Enrich.” The notion of reaching out to non-traditional and underrepresented students was a main focus of their platform, and will continue going into next year. “I want to make sure that students feel safe on campus, but also make sure they feel accepted,” says Salahuddin. GPSS held their elections May 10 and May 31, and it was quite lively this year. This year’s process had the largest number of candidates in the last five years, which generated energetic debates at the respective election days. For the first time in recent memory…perhaps in GPSS history…and to everyone’s surprise, there was a tie for President after three rounds of Instant Run-Off Voting which necessitated the second election in order to break the tie. Asad Haris, GPSS Elections Chair, was understandably surprised by the tie, especially considering that this might have been a “first” for GPSS, but he and his Elections Committee colleagues handled the situation with great skill and effort. Colorful clouds of pigmented powders filled the air above Rainier Vista on May 26 in celebration of the Hindu Festival of Holi. 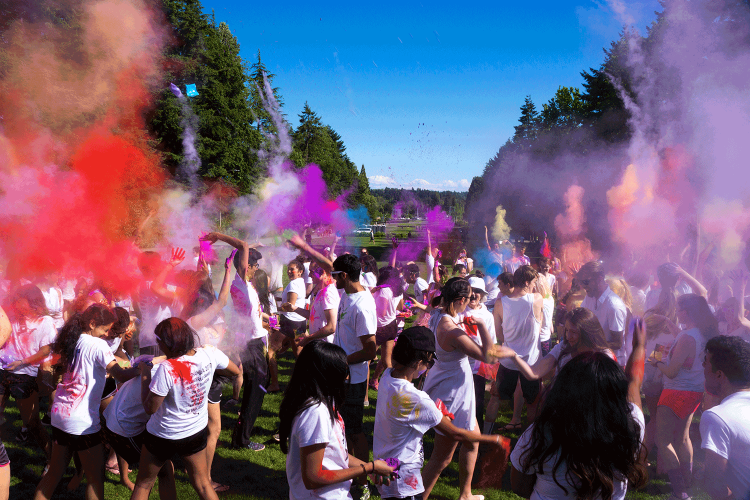 Known as the “Festival of Colors”, Holi has been celebrated at UW for the past 12 years. In collaboration with the South Asian Student Association (SASA), the Indian Student Association (ISA), and ASUW Asian Student Commission (ASC), nearly 300 students participated in the event that marks the arrival of spring and celebrates love and friendship. Additionally, the Holi Festival goes well beyond the throwing of colorful powders; it serves to promote cultural awareness, encourages a safe space on campus for everyone, and creates a sense of belonging and community. As you might imagine, the event brings such joy and excitement to campus. 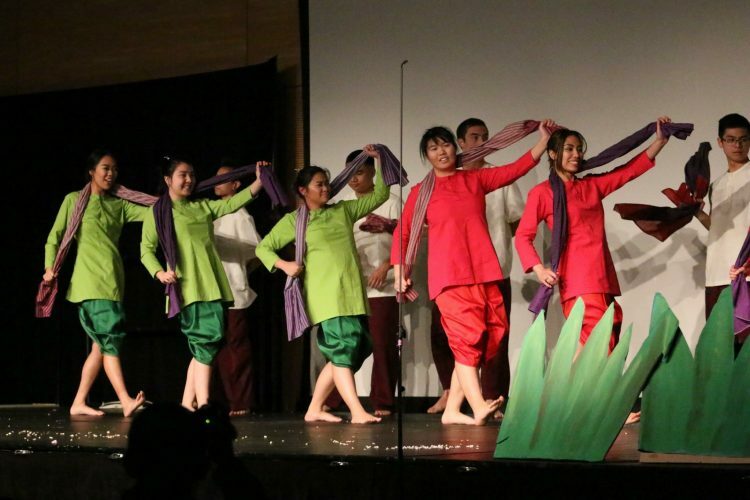 On April 15, the Khmer (Cambodian) Student Association (KhSA) hosted its 21st annual KhSA New Year Show. Taking place in the HUB ballroom, the six hour event consisted of food, entertainment, and community building. The event consisted of traditional dress/attire, a seated dinner of fish cakes and beef skewers, and a program of music, dance, and culture. KhSA was formed in 1982 with a mission to focus mostly on academics and community. Currently, it aims to engage the Cambodian community, young and old, to come together and share traditions, experiences, culture, and a rich history. KhSA has recently focused its efforts on preventing the potential elimination of the Khmer language program at UW. The association believes that the language program is imperative to the understanding of Cambodian history and culture, and feels that eliminating the language program from UW would be devastating. The New Year show opened with the “blessing dance” that is traditionally performed to welcome guests, and included the main performance of the play, “A Tale of Two Mountains,” which re-enacted cultural traditions, addressed prior gender roles, and featured both Cambodian and English dialogue throughout. The evening ended with a “circle dance” in which the entire audience moved together in a slowly rotating ring. The student organizers did a great job with this year’s event. Comparative Literature with Professor Willis Konick. He brought classics to life and walked the desk ala “Dead Poet’s Society”. Both Lincolns: Abe and Johnson. Both have bettered their surroundings and united their communities. With a 5 year old and 8 year old, my days of gathering in the Montlake parking lot to tailgate have now morphed into watching the boats arrive at the Waterfront Activities Center and then searching for Harry Husky! What has been your favorite memory of the HUB? What is your role, and your favorite thing about it? I served as the 2016-17 ASUW Director of Campus Partnership. My favorite thing about this role was definitely the interactions with students. My role allowed me to work with various student groups and communities on campus to ensure that our ASUW partners were bettering their student experience. Whether they were meetings, events, or students simply dropping by my office hours, this is what I looked forward to everyday. What has been your favorite memory in the HUB? My favorite activity has been attending the HUB Crawl during Dawg Daze! As a first year student, I was able to explore the HUB and meet the ASUW officers at that time. This event inspired me to also one day work in the HUB. If I had to eat a single food for the rest of my life, it would be cake! I LOVE CAKE. My dream job is to become a child psychologist for underrepresented communities, but also bake cakes on the side! 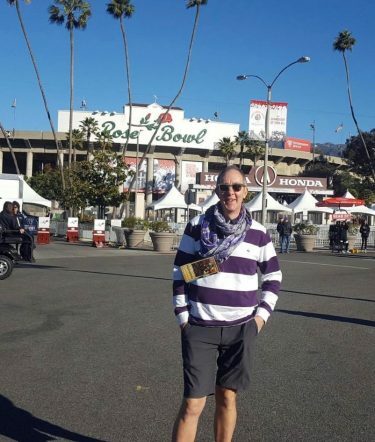 My Husky game day tradition is usually just getting dressed in as much purple and gold as possible, heading over to the game with friends, then coming back with no voice! One might say that we live in turbulent times. 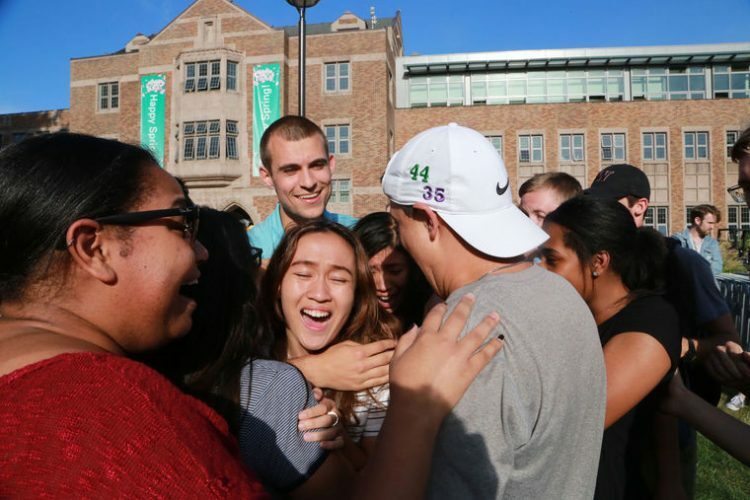 The past few months on campus have featured moments of anxiety, polarization, celebration, fear, joy, and frustration. Yet through it all, the leadership of ASUW and GPSS continue to shine brightly and do all they can to serve their respective campus communities. I would guess that it hasn’t been the easiest time for student leadership, but thankfully, our 2 student governments continue to represent, engage, encourage, and connect in positive and effective ways. No matter what role you played in GPSS and/or ASUW, I hope you reflect on your experience and see the value that it played in your life and on your development as a citizen, community member, and human being. My colleagues and I are tremendously thankful for the opportunity to play a small role in supporting and mentoring past and current leaders. Transformation happens from both ends of the spectrum and I continue to say that our work with student leaders is transformative for those of us who advise and support the services and programs of student government. I hope you enjoy this edition of the HUB Alumni Newsletter. We simply don’t have the room to cover all the good work of ASUW, GPSS and the HUB, but from what I’ve heard through the grapevine, you seem to appreciate these quarterly highlights. Be well, y’all. On December 23, 2016, the HUB Alumni community celebrated its 8th annual “Home for the Holidays. HUB staff were excited to welcome over 90 former ASUW Board members and GPSS officers and their families who came together to reconnect with old friends, meet new ones, and share memories. While some keep in touch often, some had not seen each other for years, if not decades. Justin Camputaro, HUB Director, introduced himself to the group and shared his hopes for the alumni community, while Sam Al-Khoury graciously talked about his time in the HUB and the importance of maintaining connections with one another. 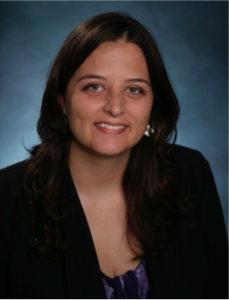 Stacey Hurwitz, HUB Alumni Intern, shared her experiences as a beneficiary of the HUB Fund, which included receiving a HUB Fund scholarship to attend the National Conference of College Women Student Leaders (NCCWSL) and expand her leadership development and skills. 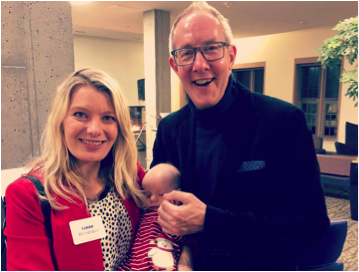 Lincoln Johnson warmly welcomed the group and raised a toast and “cheers” to the New Year and future of the HUB Alumni community. We are grateful for the continued support from our HUB alumni network and look forward to the 9th event later in 2017. If you have any feedback for this event, please contact hubalumniintern@gmail.com. 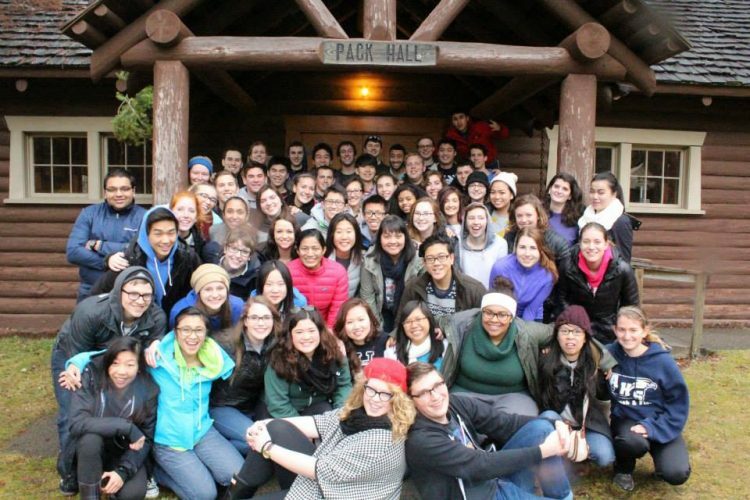 UW Leaders, an impactful program providing students with leadership development, mentorship, and a welcoming and inclusive community, has continued to be a staple of the ASUW. Founded by fellow HUB Alumni and former ASUW Vice President, Ivan Barron developed UW Leaders because he wanted “a program for emerging student leaders and help them gain a greater understanding of the role before even starting it.” At the same time, UW Leaders built a broader awareness of the Associated Students and created lifelong connections in the process. Ivan explained how he had this great feeling of community by the time he was a junior, but wanted freshmen and sophomores to feel this community much earlier than he did. Over the past 20 years, UW Leaders has grown from a once “pipeline network” of incoming student leaders that spread ASUW awareness and job training, to a vast network of mentors and mentees who continue to fulfill the mission of UW Leaders through meaningful workshops and programming. “I just wanted to do my part to make this university a better place,” says Ivan. If you were once a part of UW Leaders, we hope you would agree that he certainly helped make this university a better place. Want to share your impact? Tell your story to hubalumniintern@gmail.com. It’s here! At a HUB Alumni Board meeting in May/June 2016, members discussed the idea of improving engagement, stewardship, and connection between alumni and current ASUW and GPSS student leaders. As a result of that conversation, we are excited to announce that a HUB Alumni Network page is now available on LinkedIn! Please search “HUB Alumni Student Leader Network” on LinkedIn.com, or click the link below. On March 17, 2016, the ASUW Board of Directors passed a Board Bill establishing the Middle Eastern Student Commission (MESC). This commission was created in response to the vicious murder of 3 Middle Eastern students at the University of North Carolina in 2015, and initially lobbied for by then SARVA Director, Varsha Govindaraju, along with 12 other UW students. They came together to brainstorm and formulate a commission that works to expand resources for Middle Eastern students. Currently led by inaugural Director Varisha Khan, the MESC has been busy with responding to the impact the presidential election had on its constituents, assisting a constituent who was attacked on campus with a glass bottle, advocating for students who are refugees and immigrants impacted by the refugee crisis and the recent Presidential Executive Orders, creating resources to keep students safe on campus, and keeping its office doors open as a safe space for students who need physical or emotional support because of the climate both on and off campus. Apart from constituent support, the MESC also hosted its first event in October 2016 in collaboration with the other ASUW Commissions as well as the Student Advisory Board (SAB) of Office of Minority Affairs and Diversity and its legacy groups. They hosted the popular, “Consider the COSTume” campaign, which was a visual display of students representing a part of their communities to raise awareness about cultural appropriation. Want to learn more about the impactful work they do? Visit www.asuw.org. What was your most memorable class? No brainer there. I remember the Economics 200 class taught by the legendary Henry Buechel where on the first day he literally wiped out a quarter of his class with his opening lecture; all tests graded on a ridiculous scale. How about them apples? By the end of the quarter, only about half of the class was still there and I received a “gentleman C” (as it was known back in the 1960’s) and this was, without question, the most appreciated C grade I ever received! My intellectual hero has always been Thomas Jefferson followed somewhat closely by Thomas Sowell. Something about the amazing intellect of some people has always intrigued me. 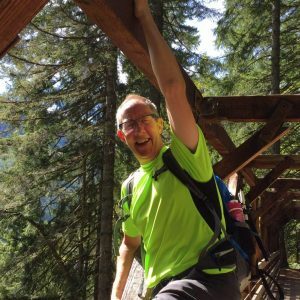 Don’t laugh, but my current hero is a gentleman by the name of Lincoln Johnson for having the wisdom to work with some wonderful staff, students, and administration and initiate the Office of Student Veteran Life at the University of Washington. Standing shoulder to shoulder with the HUB Manager, John Bickford, and backing down a huge crowd of demonstrators who were trying to disrupt a speech by Senator Henry Jackson in the HUB ballroom, and we got them to settle down and let Henry Jackson complete his speech. Challenged my adrenaline as never before or since! 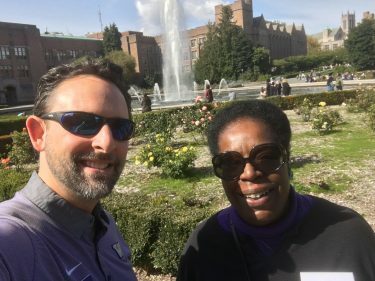 Somehow you just don’t forget those significant emotional moments and the iconic people I have had the pleasure to work with over the years at the University of Washington. First, a few brewskies are always in order as a warm up and I remember well the time I was in San Antonio, TX, at Nasty Nellie’s bar with a group of Coast Guard Officers and the place was packed with university alumni from all over the country. The guy who played the piano knew the Husky Fight Song since the Huskies had played a couple of times in the Sun Bowl so when he found that I was a graduate of the UDUB, he invited me to join him singing our fight song as the last group sing of the evening. Husky Fight Song all the way! What is your favorite Husky football tradition? A little known fact about me is that in my senior year when I was on the BOC and Executive VP of the IFC, I called the card stunts at all the home football games. There was one game where the Huskies scored a long touchdown just seconds before the half ended and the cards flew in every directions and the looks on the faces of the cheerleaders, the Sundodgers (men’s spirit group that put the stunts together), and others on the field was one of pure anxiety! Somehow the card stunts went on and the howls of glee from across the field at every stunt was absolutely hilarious! But we did it and it might have been the most entertaining card stunt program ever at the stadium. It is a shame that the tradition died, but it really was entertaining. 1. What is your current role, and your favorite thing about it? Currently, I serve on the Board of Directors as the Director of Internal Policy. My job is very internal– I basically ensure that the ASUW is following our own governing documents and Washington state laws, and work to ensure that the Association is being as transparent as possible at all times. My favorite thing about my position is that it gives me the opportunity to revise and interpret documents; skills that I want to improve before applying to law school. My favorite memory in the HUB was coming to Freshman Orientation and sitting in the HUB Lyceum with hundreds of new Huskies. It was my first event at the UW and got me really excited to come to the University. Fruity Pebbles cereal, hands down. My dream is to work for the United Nations or a similar organization as a human rights lawyer. I usually just hang out with friends before the game and swing by the UW Bookstore to pick up some UW temporary face tattoos! As you might have heard, a new HUB Director was hired this summer and he has already proven to be a tremendous asset to the student union. You can learn more about Justin further into this newsletter. I promise that I’m not going anywhere at this point. Why would I ever leave this outstanding institution? 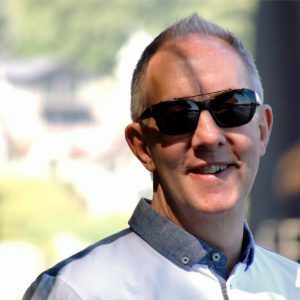 I have had the chance to support, mentor, challenge and advise the most creative, talented and intellectually stimulating students over the last 20 years and I don’t see that changing very much. That certainly goes for the strong alumni network we’ve fostered over the years. But here’s what is so awesome about the recent professional transition; it’s only going to get better because the new HUB leader is going to build upon and enhance this glorious HUB alumni network. Justin and I will continue to actively engage our alumni community and create meaningful events and opportunities. I hope you’ll stick with us. It’s going to be a fun adventure. 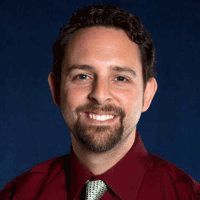 Meet Justin Camputaro, the NEW Director of the Husky Union Building! 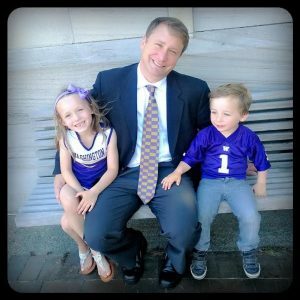 Justin Camputaro joined the University of Washington in July 2016 as the new Director of the Husky Union Building, succeeding Lincoln Johnson who served as the Director since 1996 and who will continue his role as Associate Vice President for Student Life. Justin’s role is to provide overall leadership, supervision, and management of the HUB and work with student leaders and university staff to create and implement a creative and strategic vision for the student union. 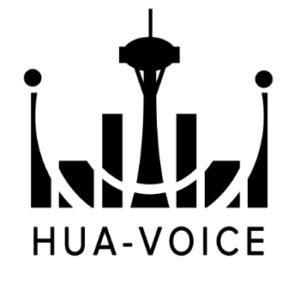 Debuting in 2014, HUA Voice was created by UW Chinese students to provide primarily Mandarin programming and entertainment for the UW campus and all the way to China. Currently, there are 2,300 daily listeners in China and the audience continues to increase. This effort is done with involvement of 30 UW students who work with HUA Voice, and it is estimated that about half of the Chinese students on campus subscribe to the broadcast. Their most popular program is called, “Ask a Senior” where experienced members of the UW community respond to questions posted by UW students via social media. HUA Radio also produces news stories, movie and music reviews, restaurant recommendations, and other stories of interest. The organizers hope to replicate HUA Voice’s success in other languages as soon as possible. If you are interested in learning more, go to www.huavoiceuw.com or download the Tune-in Radio App and search for HUA Voice. Did you know about the HUB Resource Center? Housed in the HUB, the Student Organization Resource Center, also known as SORC (pronounced “source”), provides free services to Registered Student Organizations (RSOs). SORC was initiated by students in the late 1990s and is supported by the Student Technology Fee and the Services and Activities Fee Committees. Last year, over 500 RSOs utilized its services; this entailed the use of over 2,000 feet of construction paper, 3,000 buttons created, over 2,000 balloons inflated, and the coordination of over 700 reservations for equipment usage. While it initially started in the sub basement of the HUB, SORC is firmly situated in the main flow of traffic on the 1st floor of the HUB. It’s quite the success story and it wouldn’t be without the initiative of former RSO student leaders. Next time you’re in the HUB, please stop by and check out this amazing resource for student organizations. 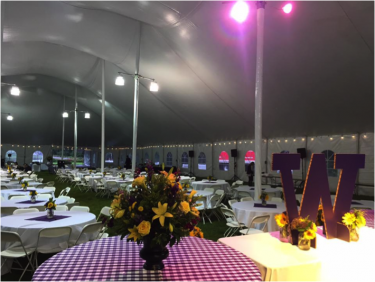 On October 21st, the University of Washington celebrated its annual homecoming celebration, which includes the highly anticipated selection for students to the homecoming court. With over 120 applicants this year, students across all majors and departments applied to be chosen for the scholarship and opportunity to be recognized on the field at halftime during the football game. Selected this year, were Rajdeep Chokar, Joshua Bean, Ivyanne Smith, and Aubrey Grower. Winning the title of Homecoming Royalty this year were students Kevin Celutska and Allison Chan. What was your favorite course you took at UW? Why? 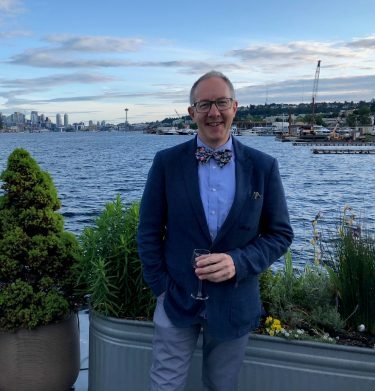 It is very hard for me to choose between my two favorite courses…the first was Dr. Stephen Bezruchka’s Global Health course on societal determinants of health (GH 514). It really did a great job of comparing our nation’s health with other countries globally. The second was not a course in itself, but rather my entire clinical practicum series with Dr. June Strickland from the School of Nursing, where I spent much of my time working on health promotion and disease prevention activities with elders. Where was your favorite location on campus? Why? My favorite location on campus is probably the HUB, followed closely by the UBooktore. I spent a year there as the Graduate and Professional Student Senate (GPSS) Secretary when the HUB first reopened, and I loved my office, my friends and the SAO staff. It was a busy environment, lots of energy, and sure beat hanging out in the health sciences building! Where are you/what are you doing now? I have an appointment as a Clinical Assistant Professor with the UW School of Nursing, and I am also active within the Department of Global Health as a faculty member for the Afya Bora Consortium in Global Health Leadership. For both, I focus my work on training nurses in leadership, public health and policy – mostly in Africa, but also locally with the tribes I have been connected to now for 6 years. In addition to this, I recently became the Director of a new RN to BSN program I am working to develop at Wenatchee Valley College. What was your most memorable moment as a student leader? My most memorable moment was with the Graduate and Professional Student Senate (GPSS). Two major initiatives that I was proud to be a part of included the creation of a Diversity Committee for the GPSS, as well as my work in science and policy activities (including annual Science and Policy Summits, DAWG Talks – much like TED Talks – science communication workshops). My work with the Diversity Committee I am also proud of – probably the most proud of – because during my term as Secretary we institutionalized the first Diversity Committee for the GPSS. 1. What was your favorite course you took at UW thus far? Why? My favorite course at UW thus far has been a current class of mine, Campaign Management. I came to UW for real, practical experiences in careers that I want to pursue, and this course has given me the opportunity to learn the actual factors to building a successful political campaign! 2. Where is your favorite location on campus? Why? The HUB! It’s the only place where I can eat, work, study, relax, and hang out all in one spot. As a GPSS representative, I think I have to say that, no? 3. What is your current position? What do you enjoy about it? My current position is GPSS Vice President of External Affairs. My favorite aspect is that as VP of External Affairs, I get to serve as a lobbyist in Olympia working on graduate student protections and issues. This position has not only given me the opportunity to expand and support my network for my future career, but allowed me to advocate for support for graduate students. I love filling legislators in on the great things that students at UW are doing! 4. What has been your most memorable moment as a student leader thus far? My most memorable moment as a student leader has been advocating for graduate student issues in Washington DC last year on behalf of GPSS. I was able to meet with Senators Patty Murray and Maria Cantwell. They loved hearing about the great work that organizations like UW Co-Motion are working on, and committed to supporting UW in the future. It was great to know that our lawmakers are listening to what students are saying and what they care about. In the Seattle area? Come back to UW and see what current student leaders are up to! Email hubalum@uw.edu to set up a time to reconnect! With the end of another academic year and commencement behind us, this moment is forever bittersweet. The HUB staff will truly miss the students who are moving on to life beyond the HUB and campus. We strive diligently to develop strong and positive relationships with our ASUW and GPSS leaders and, in doing so, build an amazing cadre of friends and mentees. Having the opportunity to witness and perhaps be a part of their transition away from UW is inspiring and humbling. The amount of pride, respect and joy I have for our leaders is immense, and I wish the very best for those embarking on new beginnings. We hope you enjoy the spring edition of our newsletter. It certainly would not be possible were it not for the fabulous Stacey Hurwitz, the HUB Alumni Intern, and the incomparable Leigh Tucker, Student Life Marketing & Communications Manager. Here’s wishing you a relaxing and glorious summer. ‘Tis the season of student government elections. GPSS elections were held on May 4, and the new officers for 2016-17 are already gearing up for another strong year of leadership and service to the graduate and professional student community. Soh Yeun (Elloise) Kim was elected President. The GPSS Vice Presidents are Sarah Loeffler (Internal Affairs) and James Moschella (External Affairs). Rounding out the GPSS leadership team are Michaella Rogers, Treasurer, and Randy Siebert, Secretary. Nearly 4,300 students voted in the ASUW election this year, which is approximately 15% of the undergraduate population. With five different tickets running this year, the outcome of the ASUW elections (May 9-11) were quite difficult to predict. The ticket, Husky Progress, won five positions on the Board of Directors, and YourVoiceUW won three. Daniele Meñez and Michael Aldridge, both from Husky Progress, won the Presidency and Vice Presidency, along with Tae McKenzie as Director of Diversity Efforts, Osman Salahuddin as Director of Community Relations, and Kaitlyn Zhou as Director of University Affairs. The elected YourVoice officers are Hakikat Bains as the Director of Campus Partnerships, Meili Powell as Director of Programming and Taylor Beardall as the Director of Internal Policy. 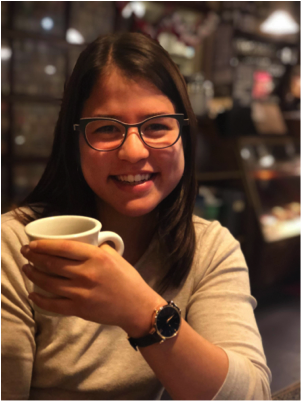 “While we ran on different slates, in the end we are forming a new team working together as the new ASUW Board of Directors,” says Hakikat Bains. On Monday, May 2, the first of three campus food pantries opened its doors in the HUB. A partnership between the ASUW Student Food Cooperative, Kelly Ethnic Cultural Center, Student Life, and the HUB, the pantry is an opportunity to provide greater food security and basic nutritional assistance to members of the UW community. 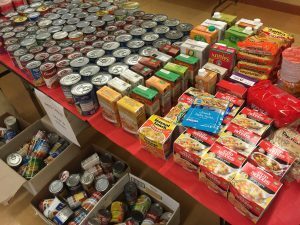 In addition to the HUB, pantries were held in the Kelly Ethnic Cultural Center. Thanks to food drives and contributions, nearly 1,000 shelf-stable, non-perishable items were collected. The program hopes to expand to more days next year. “Even if one percent of this 40,000-person university deals with food insecurity, that is unacceptable,” says Weisman, who is motivated to continue this new initiative that seeks to directly give back to the campus community and change the stigma surrounding food insecurity.